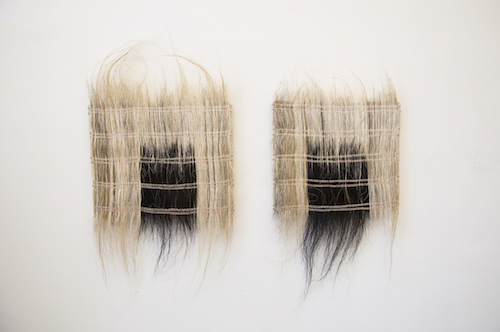 Catherine Fairbanks, Luce’s Fireplace 10 and Luce’s Fireplace 12, both 2014, horsehair weavings, dyed thread, linen, 27 x 18 1/2 x 1'' and 32 x 17 x 1''. Two chimneys, Chimney Sculpture 1, 2015–16, and Chimney Sculpture 2, 2016, stand stark in the middle of the room. Hung on a corner wall are two horsehair weavings, Luce’s Fireplace 10 and 12, both 2014, reminiscent of brushes for sweeping ash. Four ceramic and papier-mâché jugs, Jug 1, 2016, and Pitcher Sculpture 4, 5, and 9 (all 2015), are stored in the back. And five embossed drawings on paper—abstractions of lamps, pitchers, and busts—authenticate this show’s sense of shelter. In “Two Chimneys,” Catherine Fairbanks’s techniques result in ordinary magic: flour and water can make bread, or in this case, paste for paper sculpture. Pressure and heat fire earthenware, and tension combined with dye raises paper. For the show’s two eponymous sculptures, Fairbanks worked without a frame, layering pile upon pile of paper strips to replicate a mainstay of a family home—the gathering place to eat or stay warm and dry. Yet the works here are not humdrum craftwork borne from childhood nostalgia. Nor do they show signs of daily use: There’s no ash or soot, their edges don’t fray, and absent are any wine-stained rims. The jugs bear paper handles, a medium unsuited to serving liquids. If the chimneys were lit, they would burst into flame. While hearth, vessel, and light are usually humble symbols of offering and providence, the artist’s sculptures are stripped of life-giving necessity. Fairbanks attends to the common, raising the recesses of the domestic to the master’s surface.